With a simple, inexpensive low tunnel, you can start seeds in the fall and be enjoying your first harvest by the time you'd normally just be able to start planting in the spring. Low tunnels are basically mini greenhouses. They warm the soil and provide a temperate micro-climate for growing vegetables. Even though there may be snow on the ground, the temperature under the low tunnel is often just right for growing cool season vegetables such as kale, beets, and spinach. Low tunnels are easy to fit into any garden; you simply make them as large as you need them. You can fit them over entire garden beds, or just over specific parts of your garden. Low tunnels are also inexpensive. The supports can be made from copper plumbing pipe if you're concerned about using PVC, which is what most people use for the supports. However, bending the copper is a bit trickier than bending thin PVC pipes. Over the supports, sheets of thick plastic are secured by weighing the ends down with bricks or sandbags. It's easy to assemble and can be taken apart and stored when you no longer need it. Most cool-season vegetable seeds, such as lettuce and spinach, need the soil temperature to be around 40 F for germination. You can purchase a soil thermometer, but if you have a meat thermometer in your kitchen, that will work well, too. Simply stick the thermometer about two inches into the soil to determine whether it's warm enough or not. If you don't have a thermometer, just take a guess. If the soil is no longer overly wet or frozen, it's most likely ready to plant. You can also plant transplants when the soil is at around 40 F, so if you find cool season veggie transplants at your local garden center, feel free to go ahead and plant them in your low tunnel. Use a floating row cover or lightweight sheet inside your plastic tunnel. Lay it right over the plants on the very coldest nights. It will buy them a few degrees of frost protection; often, that's all your veggies will need. Place plastic milk jugs of water in the tunnel. During the day, the water in the jugs will warm up. And during the night, the heat from the water bottles will help keep the temperature inside the tunnel warmer. Neither of these measures is necessary most of the time, but they can provide a bit of peace of mind if you're worried about it getting too cold after you plant. On sunny days, temperatures inside the low tunnel can get quite warm. 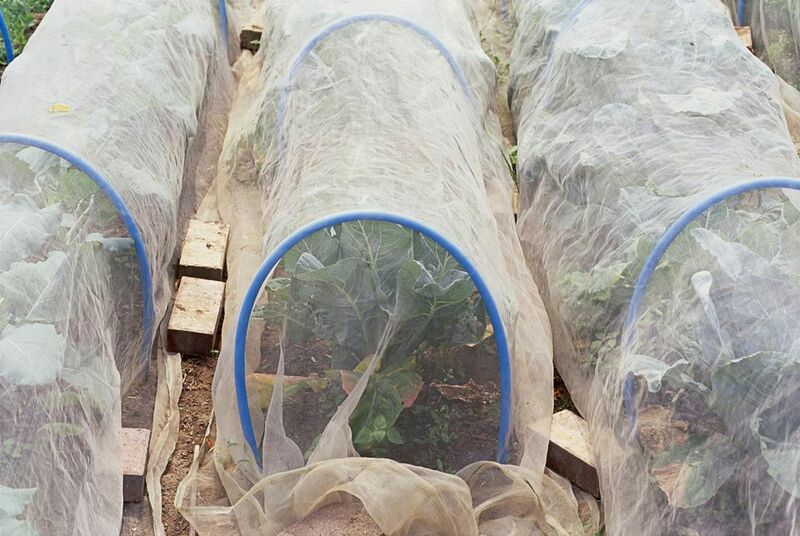 Luckily, low tunnels are easy to ventilate: simply remove the weights holding the plastic down on one or both of the ends, and pull the plastic up a bit to let air flow through. On days when it is both sunny and warm, pull the plastic off altogether, then put it back in the evening. What Spring Crops Can You Grow in a Low Tunnel? So if you're interested in extending your gardening season, consider building a simple low tunnel―it's easy, and you can garden several weeks sooner!